Plot Summary: March 25th—just another day during spring break. Koyomi Araragi, a second year high school student at Naoetsu High School, befriends Tsubasa Hanekawa, the top honors student at his school. Tsubasa mentions a rumor about a "blonde vampire" that has been sighted around their town recently. Koyomi, who is usually anti-social, takes a liking to Tsubasa's down-to-earth personality. That evening, Koyomi encounters this rumored vampire: she is Kiss-shot Acerola-orion Heart-under-blade, also known as the "King of Apparitions." The blonde, golden-eyed vampire cries out for Koyomi to save her as she lies in a pool of her own blood, all four of her limbs cut off. 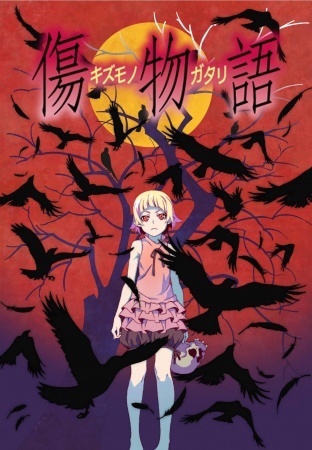 Kiss-shot asks Koyomi to give her his blood in order to save her life, and when he does, the very next moment he awakes, Koyomi finds himself re-born as her vampire kin. As Koyomi struggles to accept his existence, Kiss-shot whispers, "Welcome to the world of darkness..."